Each spring, Core and Classics students work with Prof. Stephanie Nelson and assorted faculty to stage a dramatic reading of one of the bawdy comic plays of Aristophanes. 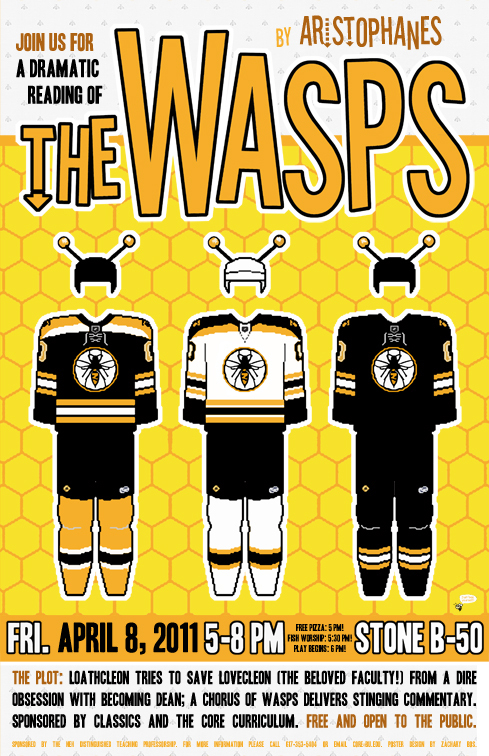 Tomorrow night, you’re invited to attend their production of The Wasps. In the Core/Classics re-invention of the play, the character Loathcleon tries to save Lovecleon (representing all the beloved senior faculty) from a dire obsession with earning a deanship. Meanwhile, a chorus of wasps delivers its stinging commentary on the action. Ask any upperclassman who’s been to the Aristophanes show in previous years, and they’ll tell you — you don’t want to miss it! Guest stars include Prof. Eckel and Prof. Samons, as well as other familiar faces from the faculty. 5:20: The Fish Worship Blues Band! The play is free and open to all — bring a friend!